The carbon potential of the equilibrium gas carburising process is usually regulated by oxygen probes. To assure the precise function of this sensor, randomly thin foils are carburised through and afterwards the carbon content is measured. This carbon content should be equal to the carbon potential measured by the oxygen probe. The carbon content of the carburised foils can be analysed by gravimetric method or by complete combustion carbon dioxide measurement. For the first handling must be done very carefully to get precise results, the second method is complicate and expensive. In this contribution a new method for the determination of the carbon content in foils is envisaged. It works distortion free and the method of measurement is eddy current with harmonic analysis, which is calibrated by GDOS (glow discharge optical emission spectroscopy) carbon analysis . This non destructive method is adapted in a small automated device, which is robust and simple to use. With this new device the carbon content of thin iron foils can be obtained with the accuracy of better than ±0.03 mass% C non destructively in less than 2 seconds within the range of 0 - 1.2 mass% carbon content . It is a powerful tool for fast quality assurance of carbon potential and therefore also of the hole heat treatment process, as it is needed in every heat treatment centre. In industry many steel parts are carburised to enhance their wear characteristics and fatigue strength. Nearly every toothed gear is carburised. More than 100 carburising plans are installed only in Germany. For the successful carburising it is necessary, to control the carbon concentration in the surface near region. This is indirectly done by oxygen probes. From the measured oxygen partial pressure and the chemical equilibrium conditions a carbon potential of the carburising atmosphere is calculated. So the carbon potential controls the carbon content in the surface near region. Because carburising is done at higher temperatures e.g. 900°C -1050°C in aggressive und dusty chemical surrounding, the oxygen probes age and drift and have a limited life time. To control these oxygen probes, pure, thin (50 mm) iron foils are exposed a short time, about 10 to 30 min, to the carburising atmosphere so that the carbon diffuses into the foil until the equilibrium is reached. This carbon equilibrium concentration in the exposed foil must be equal to the carbon potential calculated from the oxygen partial pressure in the atmosphere [1-15]. The carbon concentration of the exposed foil is measured by gravimetric method or complete combustion carbon dioxide measurement. The first method has to be done very carefully to eliminate the influence of handling on the measured weight. Fingerprints, dust, soot, and oxidation must be carefully avoided. For the second method these influences are also given, but not so strong. The main disadvantage is the large cost and the qualified manpower needed. For this reason, a new non destructive method is developed and has been calibrated by GDOS element depth profiling to get a very accurate measurement of the carbon concentration. Fig 1: Cross-section of the measured iron foils. For the non-destructive characterisation of materials the electromagnetic testing has been used successful in many applications [16-20]. The measuring effect is based on the interrelation between the condition of the material and the electrical and magnetic properties. When foils are carburised the carbon content and the cooling conditions determine the materials structure. 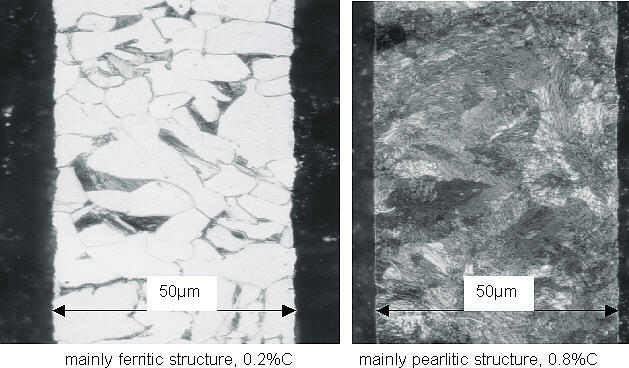 Because normally the cooling rate is slow no martensite and bainite will form and ferrite, pearlite and cementite determine the foil structure depending on the carbon content. In Fig. 1 two examples of different foil structure are presented. The different material structure of the foil with different carbon content result also in different electromagnetic properties. These properties can easily be measured by electromagnetic testing methods. 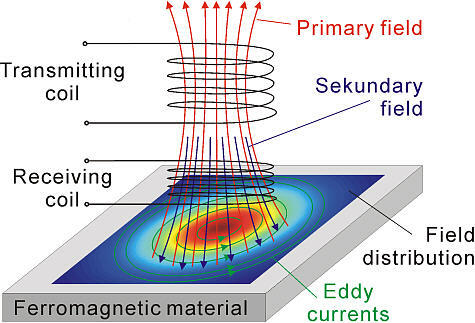 For the quantitative testing of magnetic properties the harmonic analysis of the electromagnetic field answer of eddy currents stood the test. The magnetic properties of the ferromagnetic material is contained in the higher harmonics of the signal. These harmonics describe the form of the magnetic hysteresis, which is mainly effected by the materials structure. Fig 2: Physical principle of eddy current testing. There is no fundamental theory for the correlation between magnetic properties and microstructure of ferromagnetic materials. Every test requirement is commonly experimentally examined to prove the significance of the correlation. A transmission coil produces by alternating current an electromagnetic field, which interacts with the ferromagnetic foil to inspect and produces eddy currents dependant on the material properties. These currents determine a secondary electromagnetic field, which is opposed to the primary. A receiving coil collects the superposed fields which produces a current signal for the harmonic analysis. The principle of the harmonic analysis is illustrated in Fig. 3. Fig 3: Principle of the harmonic analysis. A pure sinusoidal signal of one frequency interacts with the ferromagnetic material. The magnetic properties are described by the characteristic hysteresis curve. This transfer function produces higher harmonics of the primary pure sinusoidal signal. This deformed signal is collected by the receiving coil and decomposed by Fourier transformation into the sinusoidal frequencies. The lowest frequency is equal to the primary exited frequency. The other are the higher harmonics and occur in consequence of the non linear characteristic hysteresis curve. The development and optimisation of the sensors and coils was done by computer simulation. With the finite element method the calculations have been realised. Different parameters like sensor - foil distance, position of coils, test frequency, current and external circuitry have been varied. The most sensitive type of sensor arrangement for the thin foil measurement is the spoon positioning. On each side of the foil is a three folded coil positioned. Beside the transmission coil and the receiving coil a compensating coil is stacked (see fig. 4). The directions of the electromagnetic fields on each side are positioned toward each other. Fig 4: Schema of the coil arrangement. In this configuration an optimal homogeneous penetration of the field through the foil to inspect is given. By this arrangement a constant testing volume and minimal sensitivity concerning disturbing effects like change in distance, edge effect or influences by tilting is reached. The resulting field distribution, the coil arrangement and the frequency are illustrated in figure 5. Fig 5: Optimal field distribution as simulated. 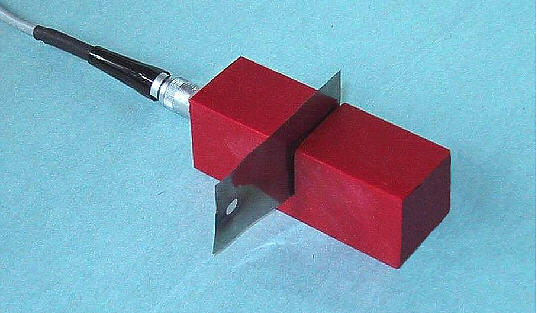 Fig 6: Prototype of sensor with foil in the notch. With this optimised configuration a sensor is constructed and tested. In figure 6 this prototype is shown. The coils are housed in a plastic material with a small notch for the foil to be tested. The positioning of the foil towards the coils must be in 10 mm distance to the edges, to minimise effects of edges. Distance effects are controlled by the width of the notch. For the quantitative determination of the carbon content in this foils a representative group of foils have to be tested and must be compared to a second measurement method. For this calibration the glow discharge optical spectroscopy (GDOS) is used, because the measured depth profile of carbon throughout the foil thickness of 50 mm gives further information about the correct carburising and the correct extraction and cooling down. Some possible mistakes are demonstrated in figure 7. Fig 7: GDOS element depth profile of foils with different cooling down after carburising. When the foils are cooled in air oxidation takes place and a change in surface carbon concentration happens. Cooling in carburising gas has the effect, that further carburising with higher potential during cooling and enrichment of the surface near regain with further carbon is observed. Sometimes a homogeneous carbon concentration throughout the foil thickness is not reached and gradient effects can influence. So the best way to take the foils is to put them long enough into the carburising atmosphere and cool them down slowly in inert gas. Fingerprints and soot don't have an influence on the harmonic analysis. Finally a set of 71 foils are carburised with different carbon potential and are analysed by GDOS element profiling and distortion free harmonic analysis, as developed. The calibration of the system is done by multi regression analysis. The measurands with the maximum correlation coefficient are chosen by Jack-Knife test. The input parameters are the amplitude and phase of the first to 5th harmonic of different frequencies. So 36 measurands are available. By the connection of several measurands the precision of the calibration can be enhanced up to a correlation coefficient of 97,5% with a standard deviation of 0.06%C. These results are shown in figure 8. Fig 8: Calibration result of 5-dimensional regression. With a better set of foils with more precise foil extraction the standard deviation would even be smaller. The harmonic analysis of eddy current signals is developed and tested as a possible method to measure the carbon content in thin foils. The accuracy is good enough for the control of carbon potential. The accuracy can also be enhanced further. The developed measuring unit is robust enough to be used near heat treatment furnaces in production to get a fast and easy control of the oxygen sensor signal and the carbon potential in carburising furnaces. The unit is easy to use and insensitive against dirt. The authors would like to thank the German Bundesministerium für Wirtschaft und Technologie and the Arbeitsgemeinschaft industrieller Forschungsvereinigungen Otto von Guericke (AIF-FV-Nr 11863) for the financial support of this work. Neumann, F.; Wyss, U.: Aufkohlungswirkung von Gasgemischen im System H2/CH4/H2O - CO/CO2 - N2. HTM 25 (1970) Heft 4, S. 253-266. Fachausschuss 20 der AWT: Verfahrensanweisung - Interne überprüfung von Sauerstoffmesszellen. Weissohn, K.H. : Messung des Kohlenstoffübergangskoeffizienten mit Hilfe von Folien und dünnen Drähten - Einfluss des Kohlenstoffgradienten. HTM 49 (1994) 2, S. 118-122. Dulcy, J.; Bilger, P.; Zimmermann, D.; Gantois, M.: Characterisation and Optimisation of a Carburizing Treatment in Gas Phase: Definition of a New Process. La mettalurgia italiana 4 (1999), S. 39-44. Kaspersma, J.H. ; Shay, R.H.: A Model for Carbon Transfer in Gas-Phase Carburization of Steel. J. Heat Treating Vol. 1, Nr 4-21. Rahmel, A; Grabke, H.J. ; Steinkusch, W.: Carburization - introductory survey. Materials and Corrosion 49 (1998), S. 221-225. Ghelec, E.; Drugá: Computer Control of the Atmospheres Composition, Having Efficient Carburizing Capabilities. Metallurgy and Materials Researches, Vol. 5 (1997) 1, S. 27-34. Strigl, R.: Härten mit Gasen - Wärmebehandlung von Stahl optimieren mit Reaktionsgasen aus Stickstoff und Methanol. Maschinenmarkt, Würzburg 93 (1987) 24, S. 66-70. Raic, K.T. : Control of gas carburizing by the diagram method. Scandinavian Journal of Metallurgy 1993, 22, S. 50-54. Naito,T. ; Ogihara, K.: Untersuchung der Direktaufkohlung im Kammerofen bei Verwendung von CO2/C4H10. Gaswärme International 45 (1996) Heft 12, S. 569-577. Lerche, W.; Edenhofer, B.: Direktbegasung mit unterschiedlichen Brennstoff-Oxidationsmittel-Mischungen - Auswirkungen auf die Atmosphärenzusammensetzung und Randschichtbildung. Einsatzhärtung Berichtsband der Tagung der AWT/ATTT 1998 in Aachen, S. 41-51. Meyer, R.: Beitrag zum Aufkohlungsverhalten technischer Aufkohlungsatmosphären. HTM 32 (1977) 2, S. 60-68. Robert, S.; Grabke, H.J. : The kinetics of carburization of g -iron in CO-He and CO-H2 atmospheres at 920°C. Arch. Eisenhüttenwes. 49 (1978) 3, S. 129-133. Klümper-Westkamp,H. ; Mayr, P.; Reimche, W.; Feiste, K.L. ; Bernhard, M.; Bach, F.-W.: Bestimmung des Kohlenstoffgehaltes in Aufkohlungsfolien.